In my last blog post, I bemoaned the lack of polling in Indiana's congressional districts and said that three of them, the Second, Fifth and Ninth had the potential to be interesting. Turns out on the very day I posted the article, a polling outfit was concluding polling in two of those districts. According to a poll conducted by Change Research, 9th District Congressman Trey Hollingsworth leads his very well funded Democratic challenger Liz Watson 52% to 45%. That 7 point margin is within the margin of error. A more shocking development is that the polling firm has the Fifth District even closer. Change Research's poll has Republican Susan Brooks ahead of her cash-starved Democratic challenger Dee Thornton 50% to 44%. GOP members of Congress in suburban districts are struggling this election cycle due to Trump's unpopularity among well-educated, affluent Republicans. As the Fifth District is dominated by northern Marion County and wealthy Hamilton County, it makes sense this district could be more competitive than it has in the past..
For some reason Change Research did not poll the Second District race between Congresswoman Jackie Walorski and her Democratic opponent, Mel Hall. It is the only district in Indiana,that political analyst Charlie Cook suggests has an outside chance of being competitive. Cook has labeled the district as "likely Republican." The Change Research poll results need to be taken with a huge grain of salt. As a polling outfit, Change Research's work product is given a C+ rating by the website FiveThirtyEight and the polls conducted by the company don't make the standards to be included in the polls listed by RealClearPolitics, the resource for most political junkies looking for survey results. While Change Research's online polling technique is relatively new, its C+ rating is still well ahead of the D- grade FiveThirtyEight gives to Survey Monkey, another online pollster regular employed by media outfits. As a political geek, for months I have been eagerly anticipating poll results in the Indiana congressional races. While independent polling outfits have conducted surveys in scores of congressional races across the country, there, to date, has been no such polling in the Indiana U.S. house races. same is not true of the Democrats do have a legitimate, albeit longshot, chance of picking up one maybe two seats in Indiana. 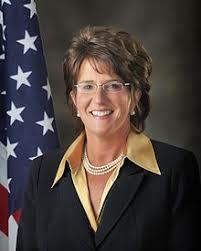 In the Second District, Republican Jackie Walorski is facing off against South Bend businessman Mel Hall. Walorski won the district by just 1% in 2012, but the last two elections has won by 20% plus. While the district has a lot of Republican-leaning rural area, the urban area in the district is dominated by Democratic-leaning South Bend. The district has the potential to be much closer this year than in 2014 or 2016. This is especially true with Hall outraising Walorski $3,028,831 to $2,580,624. The Ninth District might also prove to be competitive. Located in the southeastern part of the state, the district is represented by Trey Hollingsworth. His Democratic opponent, Liz Watson, has outraised Hollingsworth ($1,946,998 to $1,385,135) and has been consistently running ads on Indianapolis TV. I haven't seen any Hollingsworth ads, but possibly may have missed them. That district is also serviced by the Louisville and Cincinnati media markets. While Watson has run a spirited race, the rural area that dominates the Ninth District is the heart of Trump Country. Although unlikely to be competitive, I would like pollsters would look at the electorate in the Fifth Congressional district which is anchored by Hamilton County and the northern Indianapolis. 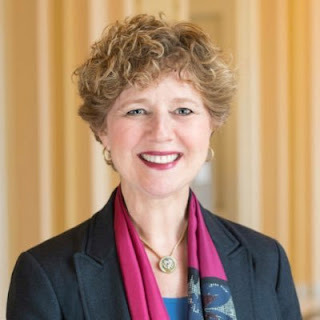 Incumbent Republican Susan Brooks won the district by 27 points in 2016 and enjoys a sizable financial advantage over her challenger Dee Thornton. Brooks raised $1,294,790 for the race while Thornton has only received $175,216. With a well-funded opponent, the Democrats might have had a legitimate, albeit a long-shot, at competing in the suburban dominated district. Brooks, after all, has to carry the baggage of Donald Trump in northern Marion and Hamilton Counties where he is not terribly popular. Of all Republicans appearing on the county-wide ballots in Marion and Hamiltonin 2016, Donald Trump performed the worst. A well-funded Democrat could have tied Brooks more closely to Trump and, thus, encouraged Republicans to cross over in favor of Thornton. This race is likely to be closer this time, but without Liz Watson type money Thornton does not have a realistic shot at winning. One of the reasons I became a Republican is that the GOP historically had a more realistic approach to deficit spending, i.e. that absent an economic downturn, the United States should not be spending more than it takes in. Although Republicans usually fell well short of that philosophy in practice, the need to control deficit spending was at least an organizing principle of the GOP. WASHINGTON—The U.S. government ran its largest budget deficit in six years during the fiscal year that ended last month, an unusual development in a fast-growing economy and a sign that—so far at least—tax cuts have restrained government revenue gains. billion in fiscal 2017, the Treasury Department said Monday. The deficit is headed toward $1 trillion in the current fiscal year, the White House and Congressional Budget Office said. Deficits usually shrink during economic booms because strong growth leads to increased tax revenue as household income, corporate profits and capital gains all rise. Meantime, spending on safety-net programs like unemployment insurance and food stamps tends to be restrained. In the last fiscal year, a different set of forces was at play as economic growth sped up. Interest payments on the federal debt and military spendingrose rapidly, while tax revenue failed to keep pace as the Republican tax cuts for both individuals and corporations kicked in. The problem with the tax cuts passed at the end of 2017 is that the decreased revenue was not accompanied by corresponding spending cuts. Instead Congress passed a budget dramatically increasing spending across the board. Then you had the added problem that the tax cuts came during a time when the economy was already experiencing solid growth. A smart move would have been to wait until the inevitable economic downturn to cut taxes, particularly corporate taxes. Instead the tax cuts ended up pouring gasoline onto an economic inferno. There was no reason to stimulate an already stimulated economy. We were already at full employment. Now the Federal Reserve is having to raise interest rates to stop inflation from taking root, a byproduct of an overheated economy. Higher interest rates mean higher deficits. 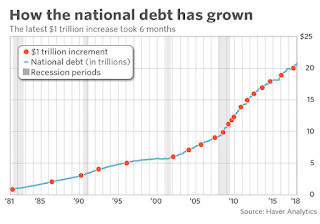 We are on track to have annual deficits in excess of $1 trillion with a growing economy. 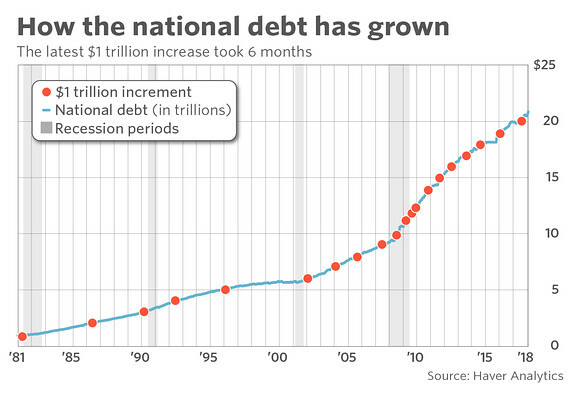 The total national debt is currently closing in on $21.66 trillion dollars. Interest paid to service the debt is the fourth largest item in the budget and is on the way to becoming the second largest item in a decade or so. Did I also mention that the Chinese own much of our national debt? What could possibly go wrong? Just a prediction, but I fully expect the first post-Kavanaugh poll to show Republican challenger Mike Braun moving several points ahead of the race against Indiana Senator Joe Donnelly. (Pre-Kavanugh polls had Donnelly up 2-3 points, well within the margin of error.) I've been saying all summer, that Donnelly was going to win Indiana. That though was before Judge Justice Kavanaugh happened. Donnelly, as did all Democratic Senators except Joe Manchin, voted against Kavanaugh's confirmation. While Democrats continue to look strong in House races, Republicans Senate candidates are surging in the polls. This morning, an Emerson poll showed Republican Dean Heller, the most vulnerable incumbent Republican in the Senate, up 7 points. The most recent polling of the next most vulnerable Republican seat, the one vacated by Arizona Senator Jeff Flake who didn't seek re-election, show the Republican Martha McSally up 6 points. Democratic efforts to take Republican seats in Tennessee and Texas appear to be falling apart post-Kavanaugh, as Republicans now have double digit leads in both states. Meanwhile, in North Dakota, the most vulnerable incumbent Heidi Heitkamp trails by 12 points. Still waiting on post-Kavanaugh polls in Missouri and Indiana, but I expect the Republican candidates in both states to have moved ahead. If the Kavanaugh-impact holds on for the next three weeks, I look for the GOP not only to continue control of the Senate, but to pick up as many as three additional seats. The 2018 election was well on its way to being a referendum on President Donald J. Trump's first two years in office. The historically unpopular President Trump agreed to the notion of his first (and hopefully only) mid-term being a referendum on his term in office. And it was not going well for Republicans. Not only was the GOP poised to lose as many as 40 seats in the House, they even faced the possibility of losing the Senate despite having an incredibly favorable map. Then Brett Kavanaugh happened. The President is simply wrong when he says Kavanaugh was "proven innocent." The fact is we simply don't know what happened 36 years ago. But to many, people it was seen, rightfully so, as a left-wing attempt at 11th hour character assassination to stop the appointment of a well-qualified justice to the Supreme Court. A lot of people, even many women, are offended by the notion that a man who is accused of sexual misconduct for something that happened decades earlier should be assumed to be guilty, even without corroborating evidence. They were likewise turned off by the mobs of people (including some who were paid by left-wing groups) who descended on the Washington, D.C. to ambush Republican members of Senate in an attempt to create viral video moments. The strategy backfired, big time. As a conservative Republican, I am embarrassed every single day that Donald J. Trump is the leader of my party and has inherited the legacy of Ronald Reagan. As was proven yesterday during the 60 Minutes interview, Trump is incredibly ignorant and lacks the temperament and judgment to be President. You could walk into any downtown Indianapolis building, after hours, find a janitor cleaning the place, and that person would be better suited to be President of the United States than one Donald J. Trump. But the fact that we have in office, thanks to my Republican Party the most unqualified President in history, doesn't make the Democrats right about the issues or that any tactics are okay in the pursuit of victory. The Democrats were spectacularly wrong in how they handled the Kavanaugh appointment and the polls reflect that. Three weeks remain to return the mid-term election to being a referendum on Trump instead of on the Democratic Party policies and tactics. That, however, may not be enough time to save several Democratic Senate candidates, including Indiana's Joe Donnelly. 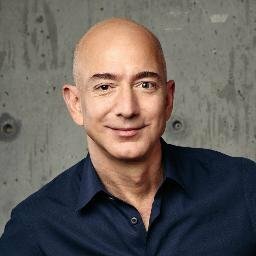 No one is more brilliant at public relations than Amazon's Jeff Bezos. As founder and CEO of Amazon, Bezos has managed to make himself the richest man in the world, all the while running a business that rarely sees a profitable quarter. Bezos does it by continually coming up with new ideas, getting massive publicity for those ideas, and then having people throw money at his company. Of course, those ideas rarely translate into a profit, but never fear, Bezos is on to another idea to keep the money coming in. Ponzi anyone? Bezos' PR genius reached new heights this week. wage to $15 an hour. Bezos was lauded by Vermont Senator (and socialist) Bernie Sanders who had previously introduced legislation aimed at forcing Amazon and other companies to offer workers higher pay so they didn't have to seek out government benefits. Senator Sanders praised Bezos for the move. Apparently, it doesn't take much to dupe Senator Sanders. But, to be fair, plenty of media types were duped as well as they, without investigation, reported the move as beneficial to Amazon employees. To begin with, most Amazon warehouse employees were already near $15 an hour, an almost mandatory rate to get decent employees in the current competitive job market. Most Amazon employees will see a $1 or $2 increase in their hourly pay. But here is the kicker. In conjunction with the raise, Amazon will no longer give employees stock and will cut out monthly bonuses known as variable compensation pay, commonly referred to as VCP. Having worked at Amazon, I know how lucrative VCP can be. VCP is based on attendance and the performance of the building. Show up for work and if the building does well, an Amazon employee can earn up to 8% of his monthly paycheck in the form of the VCP bonus. During the several month peak season, this bonus doubles to as much as 16%. The monthly bonus I received ranged from $100 to $500, or more, depending on the month. I would estimate that, over the course of a year, I earned about $3,000 in VCP, quite likely more. Do the math. If my pay goes up $1 an hour, that is an extra $2,080 in my paycheck over the course of a year. If VCP earned over the course of a year is $3,000 while a single share of stock is $2,000, pray tell how does an extra $2,080 puts me ahead? Amazon responds that the extra $1 or $2 is more certain. But VCP was certain too. You simply had to show up for work as scheduled, and you were going to receive at the very least the attendance portion of the bonus. Jeff Bezos' announcement is not about helping Amazon workers. It is about garnering positive press coverage while trying to force his competitors to pay more for their workers via a government-imposed mandatory minimum wage. Bezos is doing all this while scoring positive coverage from a compliant media accustomed to simply reprinting unquestioningly anything he has to say. The Bernie Sanders of the world are focusing on the wrong issue. Amazon's pay and benefits have always been better than average when it comes to warehouse work. The problem with Amazon is the horrific, often inhumane working conditions at their facilities that have been detailed in scores of media accounts. The fact is Bezos, a card-carrying liberal, treats his workers like he is running a 19th century sweat shop. If Bezos truly wants to do right by his workers (and stop the excessive turnover rampant at Amazon facilities), he might try treating them with respect and dignity. After all, aren't liberals like Bezos supposed to be about standing up for the workers? It is being reported that the supplemental FBI report has failed to corroborate the sexual assault allegation made by Dr. Christine Blasey Ford against Supreme Court nominee Brett Kavanaugh. Not surprising. We're talking an allegation of something that supposedly happened 36 years ago between high school kids for which there was only one other witness. Likewise, the report apparently didn't find corroboration for the allegation by Deborah Ramirez that Kavanaugh exposed himself to her in college. Again, not surprising given the age of the supposed event and the lack of people present. I am roughly the age of Kavanaugh. I couldn't begin to tell you what parties I attended in high schools a matter of fundamental fairness is on the accuser to prove it happened. 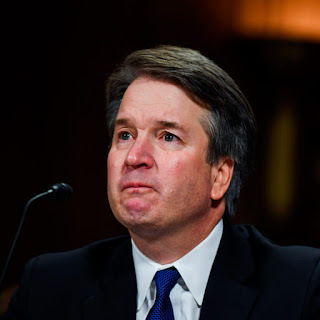 The notion that the burden switches to the accused because Supreme Court confirmation is only a "job interview" and not a criminal or civil matter is to ignore the reality that a person's career and reputation is at stake. For many people that is a much bigger matter than the potential consequences associated with a criminal charge or a civil lawsuit. I watched some of Dr. Ford's Senate testimony and didn't think she was a particularly strong witness. I was shocked when viewing the news coverage universally lauded her testimony as being credible and persuasive. (As an attorney, I've seen plenty of witnesses who were more credible witnesses than Ford despite the fact they were lying.) There was a lack of critical media coverage of Dr. Ford's testimony, in particular pointing out the inconsistencies in the story she was telling. Then Kavanaugh opponents and the media further overreached, digging up every negative thing they could on the judge and including drinking habits, yearbook entries, etc. It appeared they were moving the goalposts and piling on. Not surprisingly, that approach spurred a backlash. 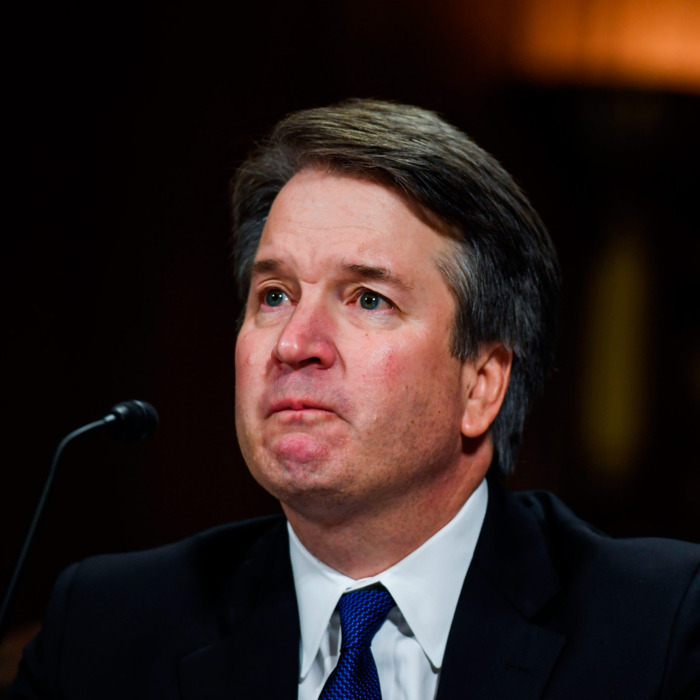 There were Republicans like me who had serious reservations about Kavanaugh's views on his perceived lack of constitutional limits of executive power and refusal to agree to recuse himself on matters relating to the Russian investigation, a matter of grave concern to the future of President Trump who appointed him. But when I saw Democrats ditch what could have been a legitimate argument against Kavanaugh's confirmation to engage in 11th hour character assassination, I went to my partisan corner. I will never forget the disgusting spectacle of the Democrats' last minute attempt to smear Clarence Thomas' reputation to keep him off the bench. Like Kavanaugh, an FBI investigation did not corroborate the accusation against Thomas. But Kavanaugh can bet, like as to Thomas, history will be rewritten so he is guilty. Kavanaugh's approval numbers are in the toilet, though much of that is tied to his close association with a very unpopular President. Nonetheless, the Kavanaugh confirmation is a voting issue for many conservatives in red-leaning states with Democratic Senators on the ballot this year. Republican challengers in those states are seeing their numbers surge of late. In North Dakota, challenger and GOP congressmen Ken Kramer is shockingly 12 points ahead of Democrat Senator Heidi Heitkamp. In Tennessee, Republican congresswoman Marsha Blackburn was even or slightly behind former governor Phil Bresden. But the Kavanaugh confirmation battle has given her a recent 5 point lead. My guess is that West Virginia Democratic Senator Joe Manchin will soon announce his support for Kavanaugh to avoid the sinking poll numbers fate of other red state Democratic Senators. I think there is also an outside possibility that Indiana's Democratic Senator Joe Donnelly will reverse course and back Kavanaugh. If Kavanaugh is, as I suspect, confirmed, my guess is that recent GOP enthusiasm for the mid-terms will wain while Democratic turnout in the mid-terms will soar. Thus, the Kavanaugh surge for Republicans is probably short-lived. That is just the way these things work. When one side gets what they want, they tend to relax while the losing side gets energized. Clarence Thomas' success in fending off Anita Hill's sexual harassment claim came at a price. It led led to the Democratic backlash in 1992 referred to as the "Year of the Woman." Then that 1992 Democratic victory led to the great Republican wave in 1994. Likewise, that period (the early 1990s) marked the end of a several year period when character issues, including sexual misconduct, played a front and central role in politics. People though grew tired of the emphasis put on those character issues resulting in the pendulum swinging back, allowing Bill Clinton and Donald Trump to become President despite their well-documented history of sexual misconduct. Republicans, with Kavanaugh, are likely to win this round. But the Kavanaugh confirmation is likely to rebound to help the Democrats prevail in November.